French painter Charles-François Daubigny, was one of the Barbizon school painters, and was also an important forerunner of the Impressionist art movement. He was born in Paris in 1817 and was initially taught the art of painting by his father and his uncle, both of whom were also painters. His father, Edmond-François Daubigny, was a classical landscape artist, while his aunt and uncle were miniaturists. In 1838 he studied under the tutelage of Paul Delaroche, an academic painter and a core member of a group of French historical painters that included Eugène Delacroix and Théodore Géricault. Daubigny apprenticed at the studio of an engraver for several years and was able to publish his etchings in two albums that were produced in 1850 and in 1851. While working as an apprentice he sketched in areas around the Forest of Fontainebleau, which is near Barbizon and around Paris. By age 18 he traveled to Italy, just like many of his contemporaries. In his early days he followed the traditional style. When he settled in Barbizon at age 26 and discovered the difference of painting outdoors, his style changed. Remarkably important to the development of his later style was his meeting Camille Corot in Optevoz (Isère) when he was 32 years old. Corot was a premiere figure in French landscape painting and he had a huge influence in the way Daubigny placed more importance on painting landscapes direct from nature. Daubigny was also influenced by French Realist painter, Gustave Courbet. By 1838, at the age of 21, Daubigny made his Paris Salon debut. For the rest of his life, he submitted landscapes to the Salon. “Le Botin” or the Little Box was the name he gave to the studio boat that he acquired in 1857. It allowed him to explore the rivers Oise, Marne and Seine, which provided him with many opportunities to paint landscapes from nature. In 1860 he made Auvers-sur-Oise his base but continued to explore the different areas of France. As he reached maturity, his landscapes were painted more freely and rapidly in the style that would later be called Impressionism. His fondness for painting outdoors also became a model for the Impressionists and Claude Monet, whom he met in London, even got himself a studio boat in 1872 because he was inspired by Daubigny. 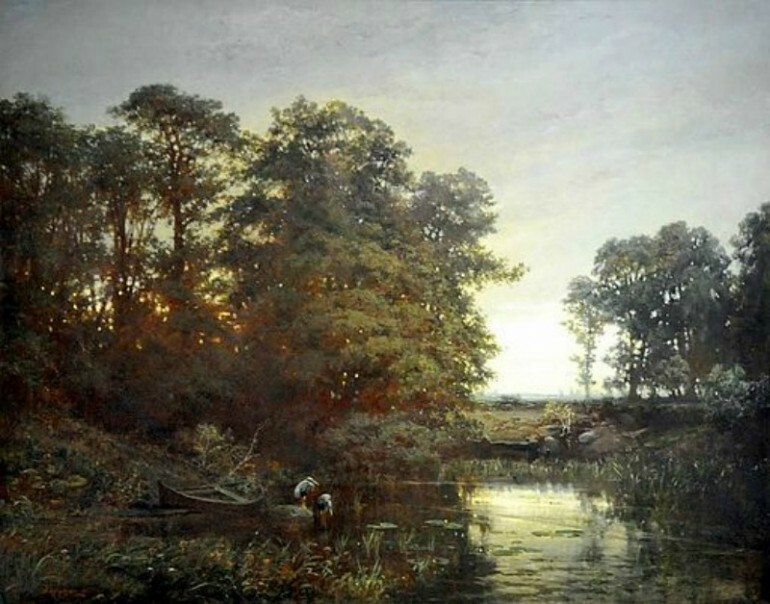 They went together to the Netherlands in search of new places to paint, wherein his style was also highly influenced by the Dutch landscape painters. When they came back, Daubigny met another important figure of the Impressionist movement, Paul Cézanne, who, like Monet was influenced by Daubigny’s style in landscape painting. Many of the finest paintings that Daubigny created were done between the years 1864 and 1874. Most of these consisted of beautifully painted landscapes showing the rivers, ducks and trees. It was a common belief that when he included a duck in his painting, it meant that he especially liked the work and the degree of his fondness for his masterpiece was indicated by the number of ducks added. Daubigny was especially known for his riverside paintings and he created several of these, although the Louvre only has two large landscapes of his but not views of the river. One of these is The Lock at Optevoz, which he painted in 1855. The other is called “Springtime” that was created in 1857. In 1859 Charles Daubigny became a Knight of the Legion of Honor and was promoted to the level of Officer in 1874. 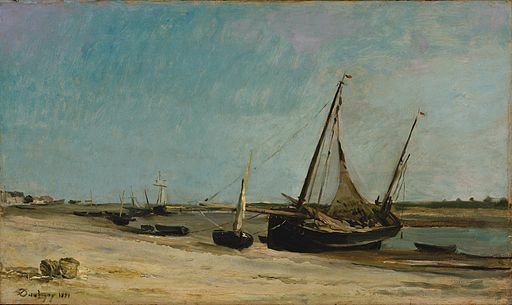 Although Charles Daubigny did not become a major artist, he was noted for being the bridge that linked the ebb of the Barbizon school and the rise of the Impressionist school.